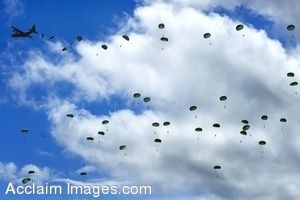 Description: Clip art photograph of U.S. Army Airborne Soldiers reenact the paratrooper jump of June 6, 1944 over Ste. Mere-Eglise. It is a long tradition to commemorate the events of D-Day. (U.S. Air Force photo/MSgt Cecilio Ricardo). Clipart photograph by Department of Defense Public Domain.